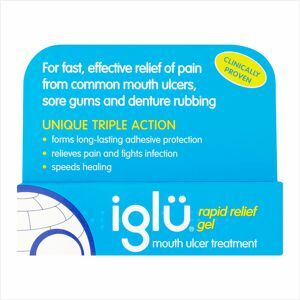 Iglu Rapid Relief gel is a fast acting mouth ulcer treatment providing pain-relieving antiseptic and long lasting adhesive protection. It is important to read the full instructions provided in the enclosed leaflet before applying this product. Abbreviated directions, for adults, the elderly and children over 7 years of age: Apply sparingly to each ulcer, using a single wiping action. Re-apply as necessary to keep the affected area(s) protected with a thin layer of gel. For use in the mouth. Do not use in cases of known allergy to any of the ingredients. Keep away from the eyes. Keep out of the reach and sight of children.